The Taliban’s recent charm offensive cements its status as a shrewd practitioner of 4th generation warfare. As countless others have pointed out, the biggest issue with Clausewitz’s dictum that war is the continuation of policy by other means is that it implies there is a clear dichotomy between the end of diplomacy and the start of war. This simply doesn’t exist in the modern era (if it ever did at all.) Indeed, in 4th generation warfare, the spoils usually go to the side that is best able to integrate their political and military capabilities. Such is the only conclusion one can draw from the Second Vietnam War, where the North Vietnamese achieved their policy objectives despite never defeating the U.S. military on the battlefield. In recent weeks, the Taliban have been proving themselves to be shrewd practitioners of 4th generation warfare. The group has long shown it can wage a formidable insurgency inside Afghanistan by combining sustained military assaults— often on high-profile targets— with adequate governance in areas it controls. But it isn’t clear that this is enough. Unlike in Vietnam, where the Tet offensive could produce real political gains, the absence of the draft has left too many Americans disconnected from the war, and therefore immune if not disinterested altogether in developments on the ground. Furthermore, it’s not at all clear that the Taliban’s military punch could successful dislodge the Afghan government security forces after 2014, should substantial foreign assistance continue to pour in. After all, the Soviet Union’s regime in Kabul withstood the insurgency after Soviet troops left Afghanistan, only to succumb to its adversaries after the Soviet Union collapsed and aid dried up. This is why the Karzai government has been so unnerved by the Taliban’s diplomatic offensive, which began long ago but has picked up steam in recent weeks. Mullah Omar’s group seems intent on wooing every interested party—and there are a lot of them, many of whom are at odds with one another— into acquiescing to the Taliban reassuming power in Kabul. First among them are Afghans themselves. Although dissatisfaction with the Karzai government is widespread, memories of the atrocities the Taliban committed when in power have left many Afghans—particularly non-Pashtun Afghans—ranging from extremely apprehensive to unalterably opposed to the group’s return to power. The Taliban have also long been promising they want an inclusive government in Kabul, not one dominated by Pashtuns only. “In his speeches and statements, our leader Mullah Mohammad Omar has repeatedly said that we want a government that includes all Afghans," Naeem told Radio Free Europe/Radio Liberty last week. "It should be a government, in which all our people and their representatives can participate and be a part of. It should give Afghans the hope that it a government for all of them and this country belongs to all of them." The group has even gone so far as to include Qari Din Mohammad Hanif, a Tajik—the ethnic minority reportedly most opposed to reconciliation with the Taliban— as one of its senior delegates in Doha. 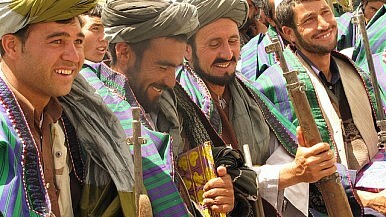 But Afghans aren’t the only party that is skeptical of the Taliban’s return. Indeed, while in power the group had an uncanny ability to alienate just about every regional state except for Pakistan, prompting them to back the anti-Taliban Northern Alliance force that denied the Taliban total control of Afghanistan. Wishing to avoid a repeat of this situation, the group has been wooing countries throughout the region. Earlier this month, some of the Taliban officials posted in Doha traveled to Iran—a country the Taliban almost went to war with in the 1990s, and one that has been supporting Karzai and Afghanistan’s ethnic Hazaras. While there, the Taliban delegation reportedly broached the subject of bringing home the large number of Afghan refugees in Iran, an issue near and dear to Tehran’s heart. The Taliban delegation almost certainly emphasized to Iranian officials their interest in cracking down on poppy production in Afghanistan, as they did while in power in the 1990s. Meanwhile, Foreign Policy reports that Chinese officials, while never breaking off ties with the Taliban, have been stepping up their meetings with the group. As with their approach towards Iran, the report claims that the Taliban have been wooing China by pledging to address Beijing’s greatest concerns in Afghanistan. This includes the group promising that they will not allow militant Uighur groups to use Afghanistan as a launching pad for attacks on China, and will protect Chinese investment in Afghanistan’s mines. This stands in contrast to recent years where Chinese citizens in Pakistan have been attacked by the Taliban over China’s treatment of its Muslim population. Perhaps the Taliban’s largest diplomatic offensive has been saved for NATO, particularly the U.S. For one thing, Taliban representatives have reportedly traveled to international conferences on the future of Afghanistan in places like France, Germany, and Japan. More importantly, are the statements they’ve made in recent weeks that their political and military goals remain limited to Afghanistan and, crucially, Naim, the Taliban’s spokesperson, saying that the Taliban’s “would not allow anyone to threaten the security of other countries from the soil of Afghanistan,” signaling that the group might be willing to break with al-Qaeda. According to the New York Times, none of this went unnoticed in Washington. Moreover, the Taliban expressing interest in working towards a peaceful solution to the conflict in Afghanistan contrasted sharply with Karzai’s erratic pullback from the process. Even after the U.S. got Qatar to convince the Taliban to remove their flag from the Doha office, Karzai continued to balk at opening talks for some time. This only worked to further America’s growing skepticism over Hamid Karzai. That being said, the charm offensive has by no means persuaded all interested parties of Taliban’s newfound benign intentions. In particular, as Sanjay Kumar reports, many Afghans remain wary. Russia too has reacted coldly to the Taliban’s outreach, and India has yet to sign off on it. However, if the Taliban can weaken NATO’s resolve to shore up the Afghan government in the years after it withdraws from Afghanistan, and assuage regional states’ concerns over its return to power, it will have a much easier time getting back in power.